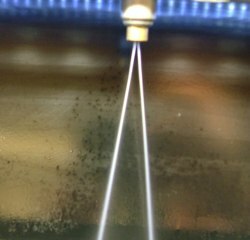 We get alot of questions about fuel injector spray patterns. Lets take a look at the various types and see what they look like. 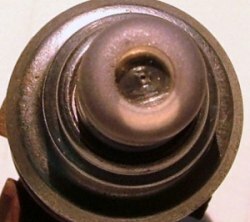 Pictured below is the earliest and the most common tapered pintle design that was used in most injector designs in the 70's thru the 80's. 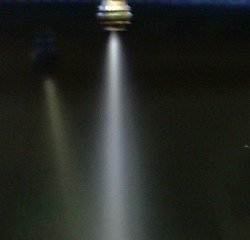 The pintle is tapered with a mushroom shaped tip causing the spray to diverge as it leaves the injector tip. 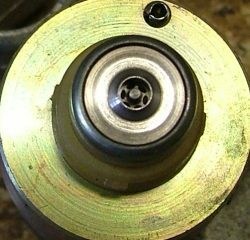 Note: the pintle cap was removed for this picture. 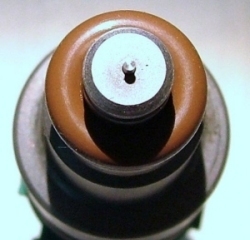 This type of injector has a plate below the pintle that has a single hole in it that provides a very narrow spray. 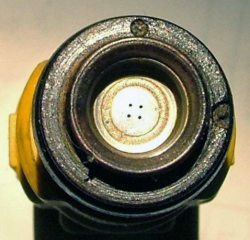 The next injector type is the two hole spray pattern type, most are used to direct the spray to either the back side of a single intake valve or to the back of a two intake valve system. Some can have a narrow "V" and some nave a wide "V". Also they can be clocked at various angles. 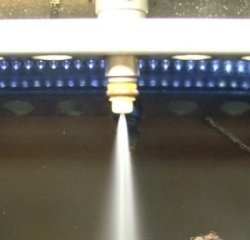 Others have a bent spray and do not spray straight down. Due to the more demanding emission requirements thru the years, the injectors makers started putting more smaller holes to help atomize the fuel especially when the engine is first started. This one has four holes. 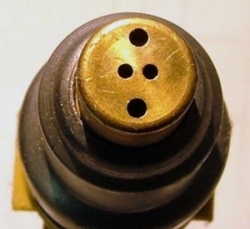 This injector has 10 holes in the diffuser plate and sprays in a "V" pattern. 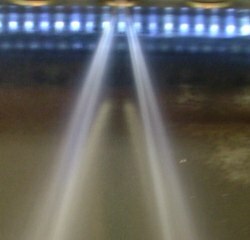 Last, we will look at the spray pattern of a TBI, throttle body injector. It is located where the carburetor used to be and the fuel doesn't hit the hot intake valve that would atomize the fuel like the multi port injector systems. 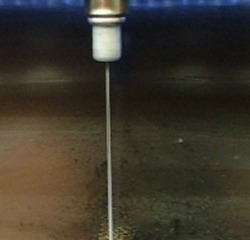 It has to spray the fuel in a wider pattern to help mix it with the air better. 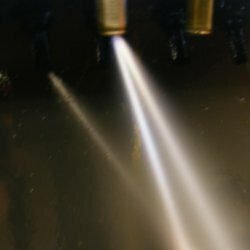 In conclusion: There are quite a few different types of spray patterns. Is one better than the other? Not really... Each type is designed for a specific type of system and simply changing from one type to another may or may not be an improvement. 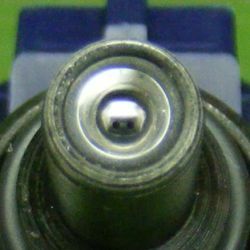 For instance, if you install an injector with a wide "V" pattern, and it misses the intake valves, it may not work as well as the stock injector. 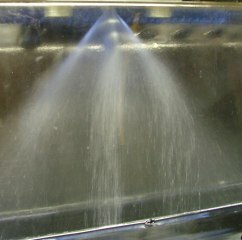 It is usually best to use the same type of injector as was originally installed.